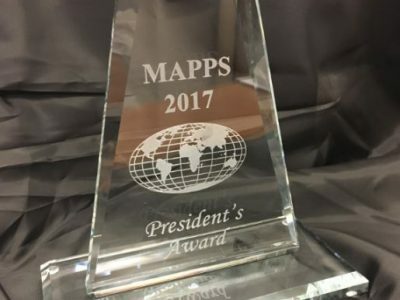 The Management Association for Private Photogrammetric Surveyors (MAPPS), the national association for private sector geospatial firms, recognized a number of individuals for significant contributions to the association and the profession at the Association’s recent annual conference in Coeur d’Alene, Idaho. 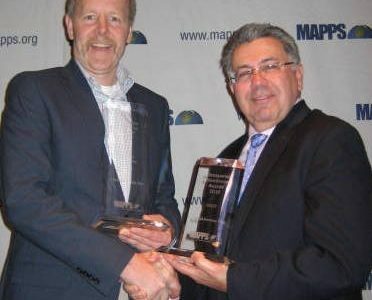 Jeff Lower, (PAR, LLC) MAPPS President, recognized the contributors, including Aerial Services’ President & CEO, Mike Tully. Mike was awarded the “President’s Award” for his contributions as Program Committee Chairman. Mike was awarded for leading this committee that establishes excellent programs for the two (summer and winter) national conferences. “It is always an honor to be recognized by your peers, and this is no exception,” explained Mr. Tully. “It is a privilege to work with other dedicated members and MAPPS staff to put together programs for our national meetings that benefit the entire membership.” In addition to Mr. Tully’s involvement in various MAPPS initiatives, he continues to represent Aerial Services, Inc., on the organization’s Board of Directors. Learn more about MAPPS and the next Winter Conference in San Juan, Puerto Rico on 26-29 January 2015 at MAPPS.org.